How to control 4 DC motors using 2 Joysticks? I'm trying to find a circuit/multiple circuits that will allow me to use two joysticks like this to control four different DC motors. 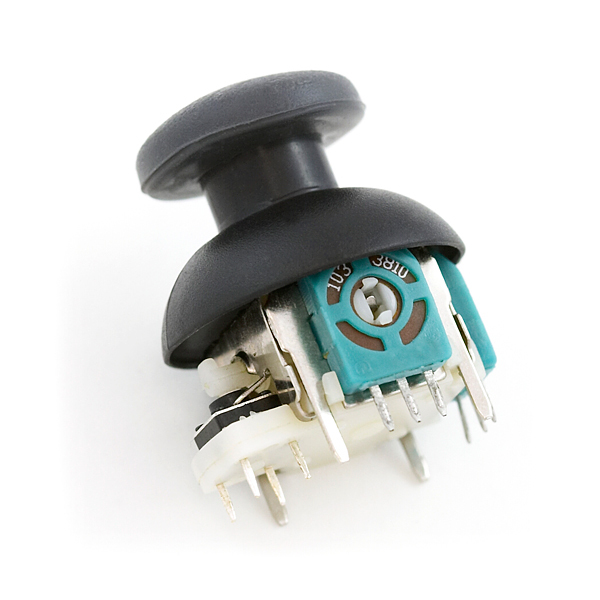 Each joystick basically has two potentiometers which are 5K or 10K on most, so each joystick should be able to control two motors. When the joystick is in the centre position I want none of the motors to move. If the joystick is moved a small bit off centre I want the motor to move in that direction slowly and if the joystick is moved a large amount off centre I want the motor to move in that direction fast. If the joystick is moved in the other direction I want the motor to move in the other direction with the same variable speed proportional to how much the joystick is pushed. When the joystick is let go I want the motor to stop where it is. Two of the motors need to be able to rotate 360 degrees and that's one of the reasons I want to use DC motors instead of servos. One of the motors will have a small gear and be driving a large gear, another will have a worm gear, and the other two will have small gear boxes built in like this. The power supply will probably be 6 V from four AA or bigger batteries. I'll be assembling all the circuits and I can make PCB's but I want to keep everything as simple as I can and the costs as low as possible. I haven't used an Arduino before but if thats the best way to do it then that'll be a good excuse for me to start using one, but I'd probably need help programming it.. I found quite a few different circuits and instructions and loads of great instructables on how people did things similar to this but none of them were exactly what I want mine to do. This seems very similar to what I want but I don't know how well it works and I don't want to buy it and it's also very expensive. This seems like it could work well and it was one of my first possible solutions if the potentiometer on the circuit was connected to one of the potentiometers on the joystick and it's one of the few ways that seem like it could do it without a microcontoller like the Arduino or something similar but again I don't know how well it would work and I'd need to make four of them in total, one for each motor which if there was a more efficient way that didn't require four circuits exactly the same I might prefer, but it does already output a PWM signal so I don't think I'd need any other circuits if I used these. A similar one is also available here. This Instructable seems very similar to what I want to do too but the only difference is that it uses servos instead of DC motors. If there was some way to convert the signal going to each servo into a signal that would work for DC motors then this might work but some sort of motor driver like a H-bridge would also probably be needed as the Arduino wouldn't be able to power the DC motors by itself, I think.. This one is close to what I want but it only has one motor and I don't know how to make it control more without making the whole circuit again, and I don't know whether it would be able to drive two or four motors and whether they'd each need a H bridge motor driver. This one also is similar to what I want but it uses servos too. This one seems similar but it also uses servos too and whenever the joystick is moved the arm moves but when it's released the arm also moved back to the centre position which isn't what I want. Here are a few more which are all a bit similar to what I want but all not quite it.. If you want precise motor control and response, I'd strongly recommend you to use an Arduino. Otherwise you can control them by using other circuits capable of providing variable input for the motor drivers. Depending on the current consumption, you'll require a suitable motor driver ( two L293D or L298 controllers). Then all you need to do is hook up the joysticks and the motor drivers to the arduino. Power up the joysticks to create a voltage divider so that your Arduino can easily monitor the position of the joystick. Now that you have the joystick's position feedback data with you, use the PWM outputs to control the speed and direction of motors. This won't be too expensive either. If any further help is needed, feel free to contact me. I will send you all the necessary schematics and codes ASAP.